Christmas lights have come a long way since early Victorian times. We no longer decorate Christmas trees with wax candles but instead we adorn our homes with glistening lights that enhance the magic of Christmas. Light is no longer just confined to the tree. It covers every aspect of decorating from the staircase to the front door and is what makes a home magical. Homes bathed in light over the darkest winter days, add to the enchantment of Christmas and the soft glow of twinkling lights creates a sense of wonder. Leading high-street retailer Robert Dyas has everything you will need to trim your house with light this Christmas. 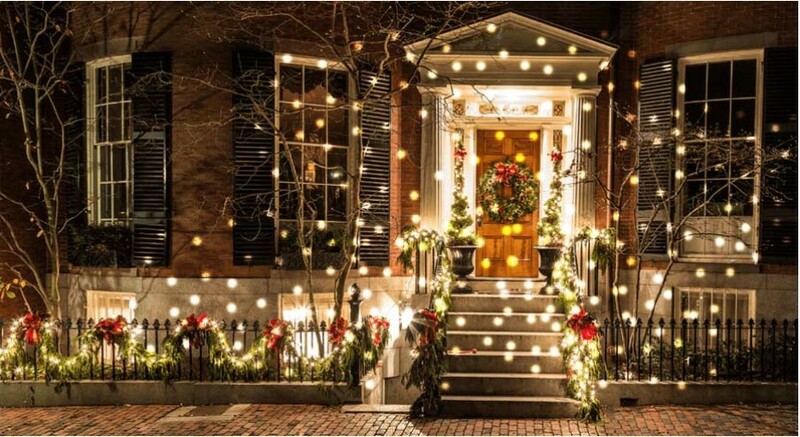 Outdoors and indoors, your house will glisten with Christmas glimmer. Nothing says Christmas like the cold, crisp snowy days depicted on Christmas cards. We may not get a white Christmas this year but with the Snowflake Projector Light (£26.59) you can light up your home with a Christmassy display of snowflakes. This projector will create the perfect snowy scene. Make sure your windows sparkle with these Warm White Led Net Lights from Robert Dyas (£19.99- £29.99). Add your own level of radiance to your home indoors or outside with a warm welcoming glow. The Christmas tree, adorned with glistening jewels of light, is the centrepiece of the Christmas home. Robert Dyas offers a wide range of Christmas lights that will add brilliance to any home this festive season. For a traditional warm white glow from the Christmas tree, why not try the Robert Dyas Traditional Cluster Lights (£19.99- £29.99)? Or for festive vibrancy, embellish your Christmas tree with the Robert Dyas String Lights, in Multiple Colours (£6.99 -£28.99). The lights will add a magical touch of red, blue, green and yellow onto your Christmas tree. Alternatively, embrace the new trend this year with the Robert Dyas Multi-Glass Berry String Lights (£17.99 - £25.99). These lights will truly add a flash of juicy red, green and yellow colour to your décor. This year why not add some festive fun with neon’s, light ornaments and mood lights offered by Robert Dyas? Explore the beauty of Christmas with the Robert Dyas Wooden Advent House (£19.99). This advent calendar depicts a quaint wooden house Christmas scene that will fill your home with a warm glow. Add a dash of nostalgia to your decorations this year with the Robert Dyas Snowman Water Spinner (£13.99). The antique style lantern will add a touch of the Victorian era to your decor. Or embrace a more modern approach with the Gingersnap Mini Flamingo Neon Lamp with a Rose Gold Base (£12.99) or the Gingersnap Mini Rainbow Neon Lamp (£12.99). Both are a perfect gift of light for those who love the latest trend. Another great gift is the Blue Sky Studios Narwhal Light (£7.99) . With just a flick of the switch the narwhal creates a beautiful magical glow. So, this year may your Christmas be light with Robert Dyas. This press release was distributed by ResponseSource Press Release Wire on behalf of Robert Dyas in the following categories: Children & Teenagers, Men's Interest, Entertainment & Arts, Leisure & Hobbies, Home & Garden, Women's Interest & Beauty, Environment & Nature, Consumer Technology, Business & Finance, Media & Marketing, Retail & Fashion, for more information visit https://pressreleasewire.responsesource.com/about.